IPL 2019: Gayle has literally ripped Siraj in his very first over. 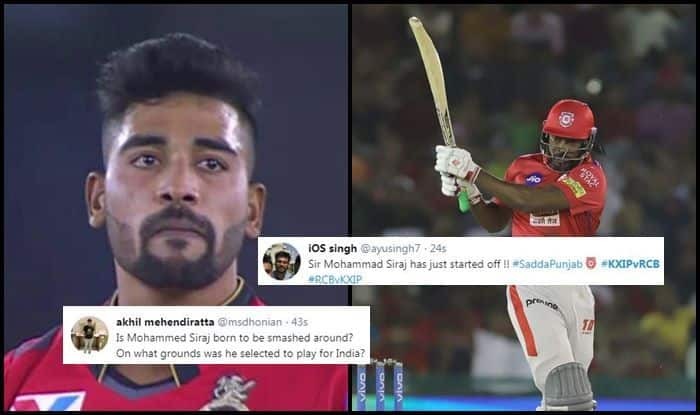 IPL 2019: Mohammed Siraj was picked for 24 runs of his one over by Chris Gayle who smashed two sixes and two fours of him. It was his first over and the sixth over, the last over in the powerplay and a set Gayle launched. Once again Gayle showed why he is the Universe Boss and fans are in awe of his hitting. He stitched a 66-run-stand with Rahul to get KXIP off to a flyer at Mohali. Rahul finally departed looking to play his shots. He scored 18 off 15 balls as Gayle did the bulk of the scoring. Mujhe Abhi Tak Ye Samaj Nahi Aaya Ki RCB Aur Sabne Mohammed Siraj Main Kya Dekha..
At the time of filing the copy, Chahal had picked up his second wicket and that of Mayank Agarwal for 15. KXIP are 86/2 in nine overs.